Making my own almond milk is a breeze. I love that I can make milk in minutes and that I know exactly what’s in it (just water and almonds, if you’re wondering.) Of course, the left over pulp is a bonus, I’ve been drying the almond pulp out in the oven and milling it into almond meal. Waste not, want not and all that! Of course, the almond meal never lasts long in our house, because I just can’t wait to bake with it! This slice has to be one of the most delicious by products of my almond milk making. 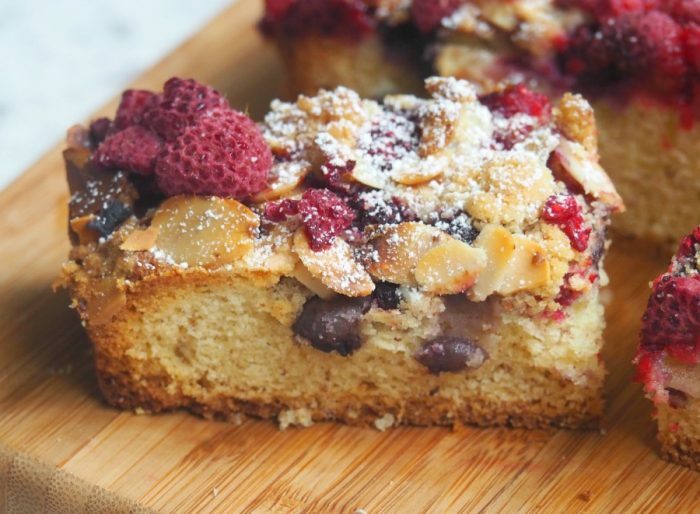 The delicious cakey base is generously topped with bountiful berries, flaked almonds and crumble topping and it’s just the business. 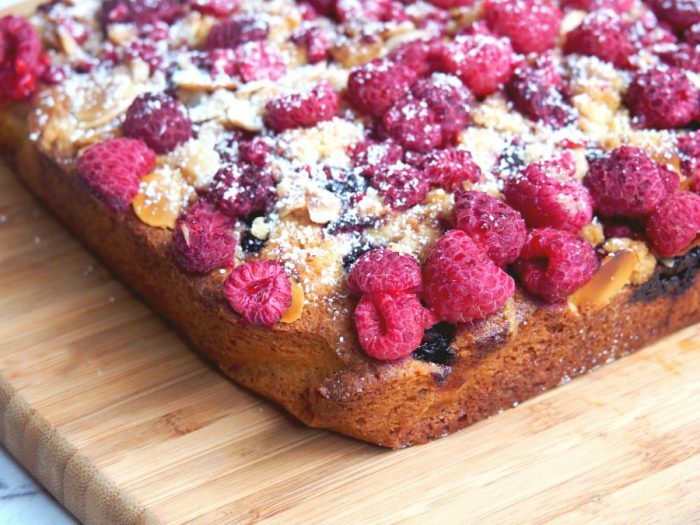 This bake is very forgiving, you can use whatever berries you have to hand and it’s freezer friendly too, which is always a bonus. It’s sweet but not overly so and the berries bring some tartness to the party. 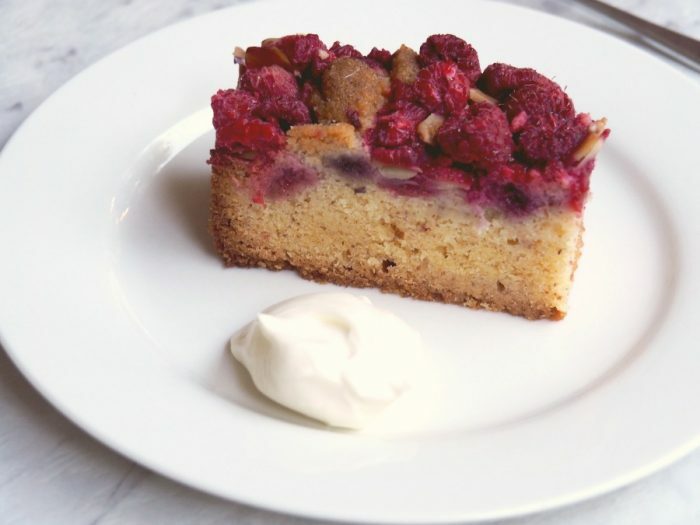 It’s super delicious on it’s own with a cuppa but it’s equally hard to resist served for dessert with a dollop of cream or a scoop of ice cream. However you serve this, I guarantee it’s berry delicious! Do you hate waste too? What’s your berry of choice? Preheat oven to 180C/160C fan-forced. Grease and line a 20cm x 30cm lamington pan with baking paper. Place flour, sugar, butter and almond meal in food processor and blitz until butter is evenly distributed and the mixture is just starting to clump together. If you don’t have a food processor, rub the butter into the dry ingredients by hand. Remove about 80g of the mixture from the food processor/bowl and set aside. Add the eggs to the mixture in the food processor and give them a quick blitz or mix with a wooden spoon. The mixture will be quite thick and not very smooth. 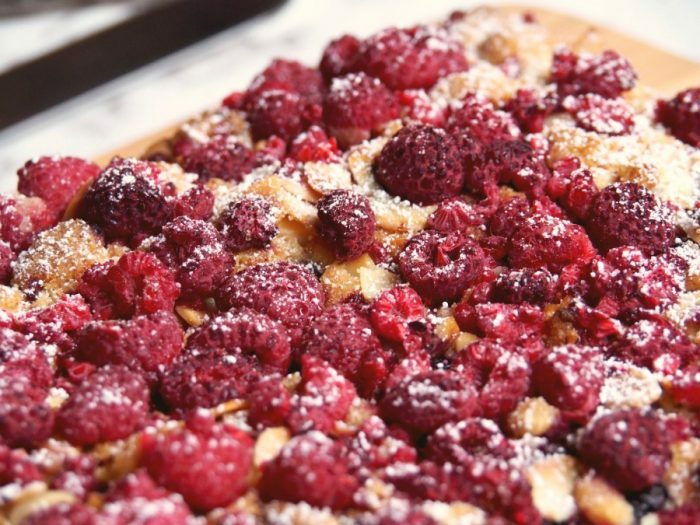 Spread the mixture into the prepared pan and sprinkle over the crumble mixture, the flaked almonds and half the fruit. Bake for 45 minutes – if the almonds are getting too brown, loosely cover with foil. 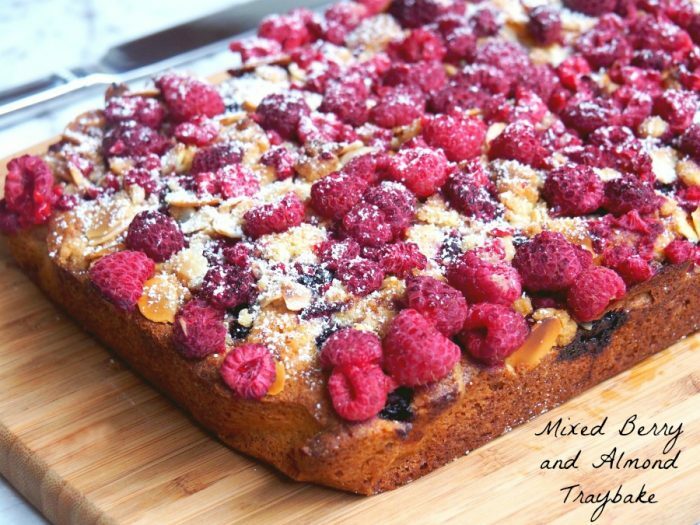 Dot the remaining fruit on top of the cake and bake for a further 15 minutes or until firm. Allow to cool in the tin. Dust with icing sugar and cut into squares or slices to serve. Place flour, sugar, butter and almond meal in TM bowl. Mix for 5-10 seconds on speed 6 until the mixture is just starting to clump together. Remove about 80g of the mixture from the TM bowl and set aside. Add the eggs to the mixture in the TM bowl and mix for 5 seconds on speed 4. Scrape down sides of bowl and mix again for another 5 seconds on speed 4. Spread the thick mixture into the prepared pan and sprinkle over the crumble mixture, the flaked almonds and half the fruit. 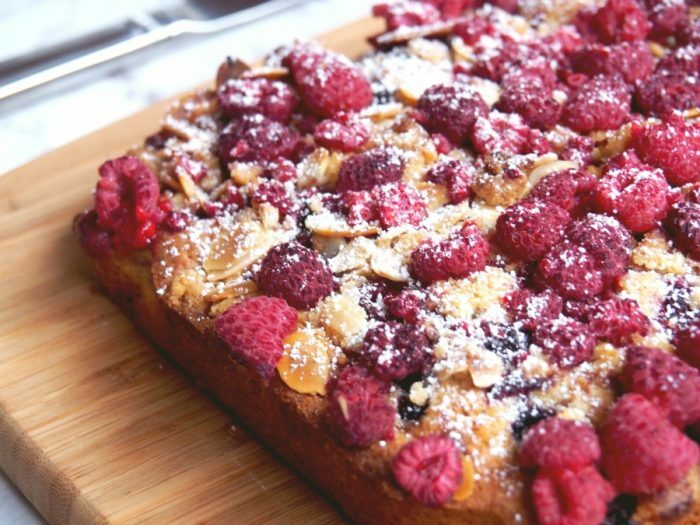 Bake for 45 minutes – if the almonds are getting too brown, loosely cover with foil.